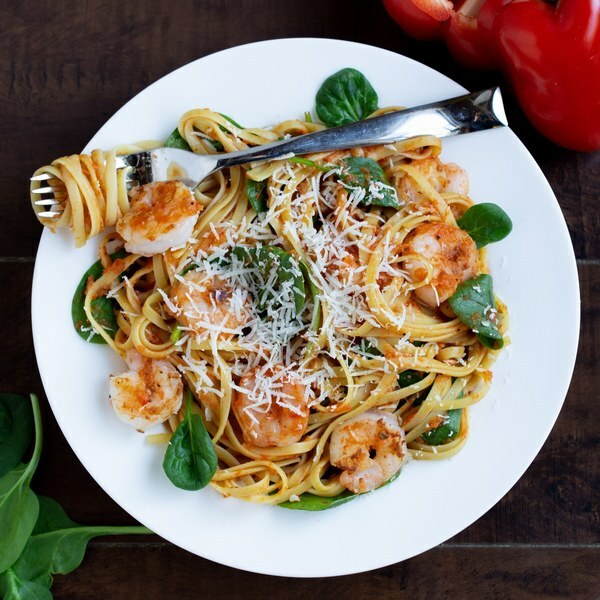 ← Shrimp & Spinach Linguine with Roasted Red Pepper Sauce. When the water in the pot comes to a boil, uncover the pot and season the water with salt, then add the pasta and stir for a few seconds. Cook the pasta, uncovered, for 11 to 12 minutes (or according to package directions). Once done, drain the pasta in a colander. Peel and chop onion into 2-inch pieces; peel garlic. Spread out on a baking sheet. Cut the bell peppers lengthwise; remove and discard the seeds and white membrane and chop into 2-inch pieces. Chop tomatoes into quarters and place on the baking sheet along with the peppers. Drizzle veggies with oil and season with salt and pepper; place in the oven and roast for 13-14 minutes. During that last 3-4 minutes of cooking, change the setting to broil and cook until they begin to char slightly. Meanwhile, heat a skillet over medium-high heat. Once the skillet is hot, add butter and swirl to coat the bottom. Add shrimp to the pan, season with salt and pepper. Cook until golden brown and pink all the way through, about 2-3 minutes. When vegetables are done cooking let cool for 3-4 minutes. Once cooled, peel the skin off the peppers and tomatoes and discard them. Add vegetables to the blender and blend until mostly smooth. Add half the Parmesan and season with salt and crushed red pepper. Pulse to combine. Return pasta to the pot, add shrimp, sauce and spinach and stir to until spinach is wilted slightly. To serve, divide pasta between plates, top with remaining Parmesan. Enjoy!